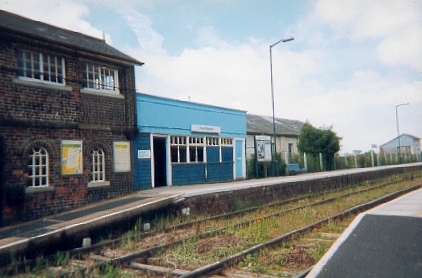 HUNMANBY RAILWAY STATION. Opened in 1847, Hunmanby Station was built more for freight than passenger traffic. It had two warehouses, serving the local agricultural community for movement of corn, seed and manishment etc. In the 1850's, Messrs.Whitaker's opened up a brickworks adjacent to the station, hence millions of common bricks, originally dried out in the open but later kiln-dried, were taken to towns such as Scarborough, Filey and Bridlington which were rapidly expanding. Originally a single-track railway, it rapidly became twin-track. During World War One, one track was taken up - to be re-used as steel for the war effort. Re-laid as twin-track after that war, it again became single-track, for economic reasons.